I am a sprouter, there is always something in a hemp bag hanging in my kitchen, and if it sprouts I will eat it! (Believe me I have tried to sprout the maddest things). My all time favorite sprout is lentils; they have a great earthy flavour and the most pleasant aftertaste that just lingers. 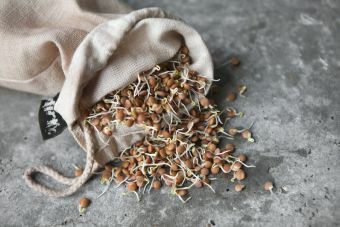 Sprouting is like vegie gardening for those with low attention spans and a demand for instant results; it never ceases to amaze me that you can grow food from seed in 4 days without soil. Mix together the dressing ingredients with a whisk, adding a little more water if needed to achieve the consistency of mayonnaise. Preheat a large wok over high heat. Add the oil and swirl around the wok, then throw in the snowpea tendrils coat in the oil for a few seconds, using use tongs to twist them around the wok. Add a splash of water and toss once, remove the wok from the heat. The whole process should take about 10 seconds. To serve, place the snowpeas tendrils on a plate and top with the sprouts. Pour/spoon over the dressing and sprinkle with sesame seeds.